In the dark hours before dawn this morning, Tuesday May 22, 2012, history was once again made along Florida’s warm and humid space coast. After a series of extensions and delays — and even one literal last-second scrub — SpaceX successfully launched its Dragon capsule aboard a Falcon 9 rocket… a trailblazing event that opens the doors of our nation’s future in space! It was a beautiful launch, and the excitement felt by everyone watching — in person as well as online — could be felt, no matter where you were. Shortly after the launch, Dragon separated from the Falcon 9 and successfully deployed its solar arrays — a key step in the mission. The Dragon capsule contains 674 pounds (305 kg) of supplies and provisions for the Expedition 31 crew aboard the ISS, which it is scheduled to dock with on Friday, May 25. It will be the first time a commercially-managed craft will dock with the ISS. In addition, the Falcon 9 rocket held the cremated remains of 308 people, delivering the ashes into space via a third-party company called Celestis. Fittingly, two of the individuals are Mercury astronaut Gordon Cooper and actor James Doohan, who played Scotty on the original Star Trek series and films. After delivering its cargo the Dragon capsule will be released from the ISS and return to Earth for retrieval and reuse. Just after launch, the White House issued a statement of congratulations to SpaceX and NASA from Assistant to the President for Science and Technology, John P. Holdren. And my own thoughts on the launch? I think there was a lot of anticipation that had built up for the event, as well as a lot of huffing and puffing about whether or not commercial spaceflight is the way to go, and some had their doubts about whether it would work at all (as some always do). But once that Falcon left the tower, shedding chunks of ice and climbing a pillar of flame into the dark predawn sky, I think a lot of minds and hearts opened up in an instant to the path that’s now been opened, onwards and upwards. Read more about the Dragon launch and mission updates on the SpaceX site here, and watch an HD launch video uploaded from Kennedy Space Center’s videographers here. Next Post A Dragon Is Berthed! 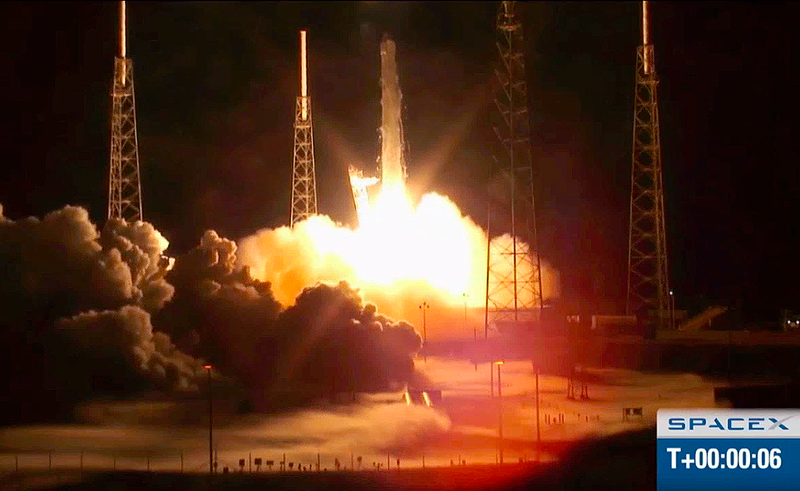 Congratulations to Space X and I hope only that Dragon capsule will can to dock to ISS. It’s a new vision and a new step to space conquest.